Today the postman was very generous, and delivered some Rowan and Debbie Bliss yarns that I ordered for a couple of projects (a knitting needles case and a clutch bag – more on those at a later date…). It’s made me realise that I have a real weakness for gorgeous yarns, here’s a pic of what’s currently in my stash. 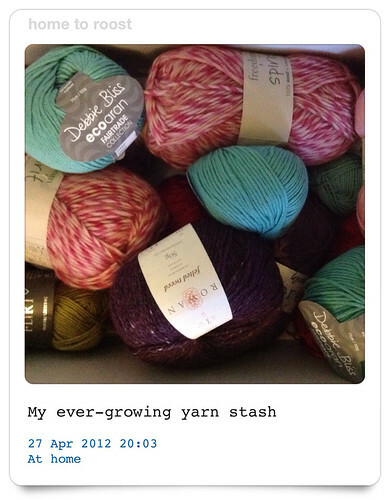 What have you got in your yarn box, just waiting for that perfect project? Having finished my sheepish girl-inspired crochet buttons, I’m determined to finish my house tea cosy before launching into my next project. I’ve knitted the four sides, now I just need to tidy up the loose ends, define the windows and doors, and then sew all the bits together. The big question is, will it actually fit my lovely Le Creuset teapot? Hi Nicola, I can be a complete impulsive yarn buyer, but my latest two are for actual projects ( just need to find the time now to complete them!). The gorgeous purple Rowan felted tweed is for this bag – http://www.themakingspot.com/knitting/pattern/vintage-rose-purse. And the Debbie Bliss will hopefully someday transform itself into a bag for my knitting needles – please keep everything crossed! Is your throw on your blog, I want to take a look!